A practical guide to reading a lot. 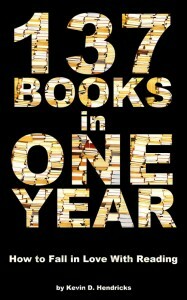 Author Kevin D. Hendricks read 137 books in 2012 without giving up TV, a day job or becoming completely antisocial. He shares what worked for him, including carrying a book everywhere, reclaiming idle moments and not being ashamed of genre. Read the latest news on 137 Books in One Year. See more on Goodreads or Amazon. There are the blurbs and quotes that probably won’t make the back cover, but I still enjoyed them.